Letting your property can often be a very difficult and stressful experience and legal requirements must be complied with or landlords risk prosecution. The decision to let your property is a major one and not something to be taken lightly. It is therefore important that you engage the services of a professional property company. Our aim at Reading Estate Agent Ltd is to provide you with a service tailor made to suit your requirements. The letting market is growing steadily but some of the basics relating to a successful rental remain the same. We have produced a guide to assist you in making that important decision. Presentation is extremely important when letting a property. It can affect the level of rent and the speed at which the property is let this may appear to be obvious but it’s amazing how some landlords ignore the basics. Even more importantly, it can affect how the tenant will look after your property. If someone moves into a well presented home, they are very likely to keep it that way. If it starts off looking scruffy and unloved, it can give the wrong impression to your tenant all rooms should be freshly decorated in neutral colours. Floorings and carpets should be clean and damage free. If there is a garage for the tenant’s use it should be empty and tidy. Lighting is essential; there should be good quality light fittings that are in working order. If you are thinking of letting the property furnished or unfurnished we have prepared this guide as a helping hand. What Legal Obligations Apply To Furniture And Fittings? The Furniture and Furnishings (Fire) (Safety) Regulations 1988, as amended place a legal obligation on residential landlords to ensure that upholstered articles meet fire resistance regulations. Non-compliant furniture must be removed from a property prior to letting. Furnished Or Unfurnished, That Is The Question? For many reasons, this is much less complicated than with a furnished property. A cooker and other white goods such as a washing machine and fridge/freezer are usually required. Tenants almost always expect to have carpets and curtains as it is impractical for a tenant to transfer them from their previous home. We would also recommend the property to be cleaned prior to the commencement of the tenancy including the carpets, curtains and linen. In order for you to achieve the full rental potential of your property, it is important to blend the furnishings with the premises so that they are of equal quality as the property. It is very difficult to advise on what items would be required to furnish the property. A good method is to put yourself in the tenant’s shoes and imagine that you have no furnishings, ask yourself what you would expect. Please help yourself and click below for the Basic Furnishings Listing leaflet. The garden should be left tidy and well tended. If you have a very large garden or special plants, shrubs that need attention you could consider providing a gardener, this cost should be factored into the rental. Fencing and boundaries should also be in a good secure state. We would also prefer if would notify us of the responsibilities of your property. You should inform all utilities and service providers that you are letting the property and request closing accounts. Tenants are responsible for telephone arrangements, council tax and accounts for oil or calor gas supply. You will also need to make arrangements with the Post Office to forward your mail (we cannot forward mail without passing on the Post Office charges). Notify banks, credit card companies, publications to which you subscribe and any other organisations connected with you. If we manage the property we will contact utility and service providers and check the tenant in and we will also close the accounts on check out. If the property is your usual residence and the mortgage is not a BTL (Buy To Let) , you must advise your lender and seek their permission before making arrangements to let. If you do not do so, they may be entitled to repossess the property and evict your tenants. It is rare for lenders to refuse permission, but you must ask them first. If the property is leasehold you should seek permission from the freeholders or Management Company and inform them of your intentions. A landlord is responsible for arranging insurance on the buildings and any possessions left within the property or outbuildings. This insurance should also include personal liability insurance to cover you, for example, if a flat that you let has a washing machine that floods and damages the flat downstairs. It is preferable for this insurance to be a specialist letting policy, as standard policies may exclude certain situations such as damage by tenants – even where the damage was unintentional. Specialist policies can also cover for theft by tenant, malicious damage and accidental damage to your goods by the tenant. The tenant is responsible for arranging insurance for their own furnishings and possessions and will not be able to claim on your policy for loss or damage. At Reading Estate Agent Ltd we can arrange all appropriate insurances at a competitive rate. When a Landlord is living abroad it is your responsibility to appoint a suitably qualified person such as an accountant or solicitor to act on your behalf in respect of taxation matters. If this is not arranged by you we as your rent collecting agents are required under UK Taxes Management Act 1970 section 78 to deduct income tax (currently 20%) at the basic rate from gross rent received. Overseas clients may be entitled to reclaim from the Inland Revenue the whole or part of any tax deducted in this manner dependant upon their individual circumstances. Please contact your local tax office to obtain a NRL (Non Resident Landlord) number to avoid this deduction. It should be noted however that items such as ‘Agents and Management Fees’ are tax deductible from rents received from the property letting. Your accountant or tax office will be able to advise more fully. Please refer to our Terms & Conditions in respect of the self assessment landlord tax liabilities. All landlords have a duty of care to their tenants. This duty is covered by a number of laws and regulations but the simplest way of viewing your responsibility is to say that you must do everything reasonably possible to ensure your tenants’ safety in the rented property. You must ensure that any furniture and furnishings you supply meet the fire resistance requirements in the Furniture and Furnishings (Fire) (Safety) Regulations 1988 (as amended 1993). The regulations set levels of fire resistance for domestic upholstered furniture. All new and secondhand furniture provided in accommodation that is let must meet the fire resistance requirements, unless it was made before 1950. Most furniture will have a manufacturer’s label on it saying if it meets the requirements. • Ensure installation pipe work, appliances and flues are maintained in a safe condition. • Ensure an annual safety check is carried out on each appliance and/or flue. • Ensure maintenance and annual safety checks are carried out by Gas Safe registered Engineer. • Keep a record of each safety check for 2 years. • Issue a copy of the safety check to each existing tenant within 28 days of the check being completed and to any new tenant before they move in. • Ensure all gas equipment (including any appliance left by a previous tenant) is safe or otherwise removed before reletting. If a managing agent is used, make sure that the management contract clearly specifies who is to make arrangements for maintenance and safety checks to be carried out and for keeping records. However, the landlord maintains overall responsibilities for ensuring duties are met, irrespective of whether a managing agent is employed. NB. We advise the use of a carbon monoxide detector in a let property. You must ensure that the electrical system and any electrical appliances that you supply such as cookers, kettles, washing machines and immersion heaters are safe to use. Instruction booklets should be provided for each appliance. Plugs and sockets must comply with current legislation. You have a duty to ensure that the tenants’ environment is safe and, in this connection, Reading Estate Agent ask that properties are supplied with smoke detectors. Where they are not fitted, we can arrange this on behalf of clients. New properties, built since 1992, must have mains interlinking detectors on each floor. Although safety is ultimately your responsibility, Reading Estate Agent can help to ensure that all these regulations are met before letting a property. Our experienced property consultants would be pleased to meet with you to advise on all aspects of letting and discuss the achievable rental value. When we have received your instruction to find a tenant our creative marketing approach includes all forms of modern media, our eye catching boards, regular advertising ,marketing campaigns and hourly updated website as well as Rightmove and many other portals. Potential tenants wishing to view the property are accompanied by a negotiator. Once an applicant has expressed their interest, the next stage is referencing. Our aim is to take every precaution to introduce the right tenant to a property to ensure a trouble free let. 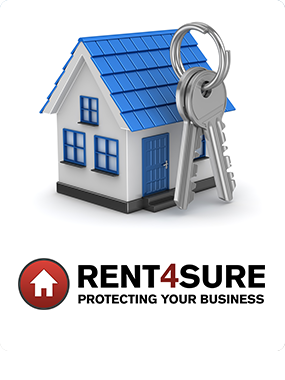 To this end we use our own Tenant Assessment Service for referencing, which includes a comprehensive Credit Check using Rent4Sure. As well as landlord and employment references. This service is provided at no extra cost to the Landlord and is the best way to harness all of the information available in today’s complex lettings market place. This ensures that when the tenant enters the property, they have been thoroughly and independently assessed and verified, for financial strength and suitability for the tenancy. Our tenancy agreement is carefully constructed to protect both you and the tenant without the inclusion of any ‘unfair terms’ – no easy task! Problems with tenancy agreements are one of the most common causes of court action between a landlord and tenant – ours has been created through years of experience. Most tenancies are Assured Shorthold Tenancies but we also arrange Company Lets (which are used when a company takes a tenancy on behalf of an employee) and other Non-Housing Act tenancies to suit the situation. Other documentation includes the Inventory, a vital record of what is in the property and its condition at the beginning of the tenancy. This is agreed with the tenant at the beginning of the tenancy and used again at the end of the term, to give a clear report on any problems. Wear and tear is expected and accepted in a tenancy, damage or removal of items by a tenant is not and must be rectified at the tenant’s cost. Landlords sometimes consider that their family or a friendly neighbour will be able to manage their property during their absence, using a local known contractor for any maintenance. However there is more to property management than this. Property Management can be demanding and involves collection of rent on a regular basis and ensuring that rent continues to be paid for the period of the tenancy, making visits to see that tenants are taking care of the property, checking for any general maintenance and arranging contractors (and that their costs are fair and the work is done properly), our maintenance department, liaising with our Property coordinators, will deal with any emergencies such as storm damage, leaking or burst pipes. Our experience means that we have seen most disasters before and we know how to approach them, who to contact and most important of all how to get claims settled to cover loss of rent and damage if a problem does occur. With our property management service your home is in safe hands! After years in letting industry we know that efficient, personal service is the most important aspect of our business. Landlords like to speak to someone they know and to be able to rely on that person carrying out the task in hand. Many landlords have, like many of our staff, been with us for years. We have helped them with their first letting, advised on buying further properties and kept them updated on legal and tax issues that affect them. We have a maintenance team which takes care of all property maintenance, refurbishment and development, and many of our contractors have worked with us since we were established. They understand the need for efficient, economic and professional work. We can however use you own preferred contractors or have an agreed limit set in place at the beginning of a tenancy for essential repairs. Communication is one of the most important issues to landlords during and between tenancies. Email is sometimes the preferred method of communication for many landlords and is priceless especially if a landlord is abroad, we still actually telephone people and write to them as well! We believe that modern methods work as well as the traditional methods. Know how is one thing, management and implementation of that know how is another. We have invested in specialised software which helps us to ensure that rental payments are passed on accurately, timely and efficiently. Property management matters are diarised and expedited when due. Our range is further extended by not only our own website but most of the popular property portals this is becoming one of our most important marketing methods. New people looking to rent in our area for the first time can instantly see homes available to rent. As soon as a new property is registered with us that all potential applicants are notified by either letter, text (SMS) or email instantly. Interested parties can (and often do!) 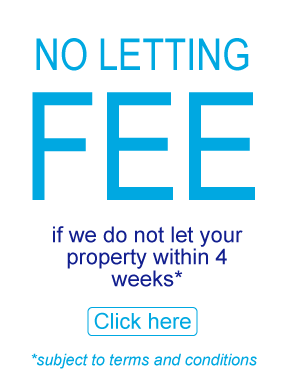 make appointments to view by e-mail, phone or by replying to one of our property bulletins. Generally, our landlords choose one of three main service levels available: Let Only, Rent Collection, Full Management. However, our services can be packaged to suit individual requirements, our negotiators can advise you of the options and how each service can be appropriate. Reading Estate Agent will give advice and guidance on preparing the property for letting and we will source a suitable tenant by using the numerous marketing methods we employ. References are then taken and legal documentation drawn up. Finally the initial rent and deposit monies are collected in cleared funds and after we have advised the tenants of their obligations and signed the tenancy agreement we allow them to take possession. The tenancy is then ‘handed over’ to you or your representative to collect rents and provide a management service to the tenants. At the end of the tenancy we will be happy to prepare renewal agreements or find a new tenant for you. This service follows the same procedure as with the LET ONLY service. 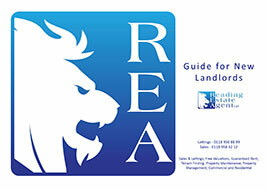 However, Reading Estate Agent will alleviate the responsibility of rent collection. Rental payments will be collected by Reading Estate Agent on a monthly basis and paid over to the landlord along with a monthly statement. As the landlord, you will still provide a management service to the tenants. We will provide you with a property inspection and report on a biannual basis. Liaise and organise with both Landlords and Tenants for the renewal of tenancy agreements. At the end of the tenancy, we will serve all necessary notices. Check out procedures will be followed and the deposit monies will be apportioned as necessary. Our rates will be agreed in writing on our contract at the time of instruction. All our rates are agreed to suit the landlord’s individual requirements. We are very flexible to all our landlords and will be able to provide you with a competitive rate that will be among the best in the market place. If you have any questions or require any further information about any of the above then please pick up the phone and speak to one of the team. 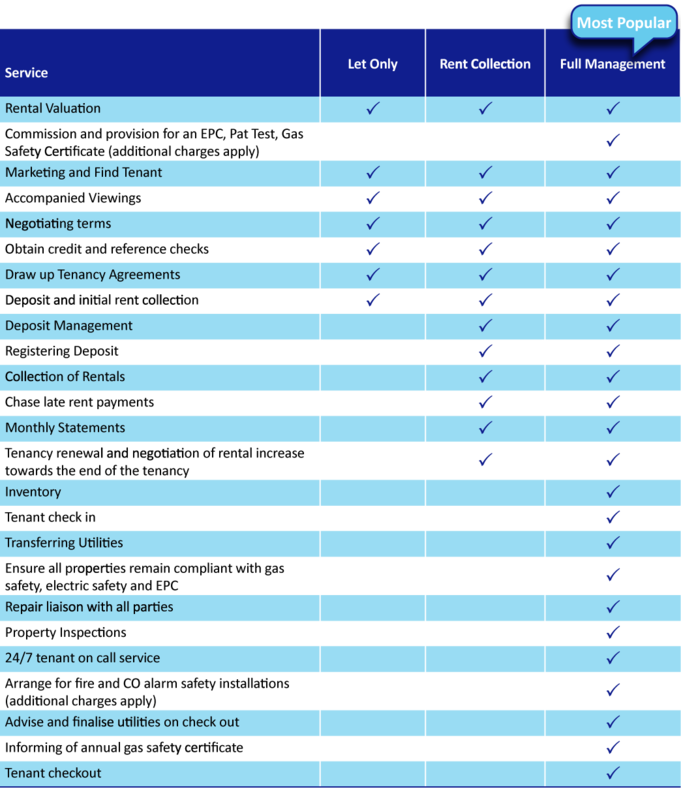 Please view our Service Comparison Chart Table below. Rent Collection including rent collection, arrears collection, accounting and renewal negotiation. Gas Safety Administration Fee – Arrangement of Gas Safety Certificate where one is not provided at the commencement of the tenancy – Administration Fee.